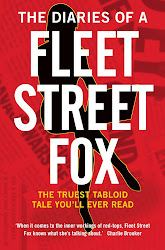 fleet street fox: Is there anyone there? ANOTHER day, another slew of research from the University of the Bleedin' Obvious. Today I have 'learned' that fruit juice isn't as good for you as eating actual fruit, women are more careful at parking in a strange car than men, and having a couple of glasses of wine a week probably isn't going to kill you. Thanks for that, boffins. Did you use your whole grant on those studies or is there some left over to find out that Devon is a nicer place to live than Tower Hamlets? Oh, I see you've already figured that one out too. But we shouldn't mock the UBO. A lot of people don't even realise it exists and some even ignore its constant efforts to teach the nation the stuff it knows full-well but can't be bothered to remember. It was a graduate of the UBO who, while inexplicably attending a show by self-professed psychic Sally Morgan, overheard two technicians at the back of the auditorium feeding her lines about audience members which she would 'channel' onstage 10 seconds later. When this was pointed out during a radio phone-in Sally got in a right old tizz - and no surprise, seeing as she's in the midst of a year-long tour of theatres selling tickets to several thousand people a night, three nights a week, at £25 a head. I'd get in a tizz if I saw that much cash going up the swanney. Anyway Sally, whose main qualification appears to be that the delightfully-batty Princess Di used to ask her for advice, has gone on the offensive by telling audiences she has no ear mic and pulling her hair behind her ears to prove it. She even made dark claims that she had no choice but to turn over, by my reckoning, a minimum £100,000 a week because if she didn't 'talk to the dead' the spirit world would take grisly revenge. "They up there would do something to me. I don't want the ceiling to come crashing down on my head," she said in a tearful, 10-minute diatribe. Well they wouldn't do that, Sally, because THEY'RE DEAD. It's hard enough to kill someone if you're alive, it's even trickier if your body's been reduced to its constituent atoms. And as the dean of the UBO might point out - if the dead feel like taking revenge, there's around 100 billion of them and only six billion of us. We'd be heavily outnumbered and there's bound to be more than one of them with a grudge. Yet they seem, so far, relatively at peace except for the spirits who turn up to millionairess Sally's mass-séances with the sole intention of telling a bereaved relative 'the pain has gone'. Of course the pain has gone, they've no nerve endings. Hello? If I've paid £25 for a ticket I want you to tell me where Grandad's money's buried or at least get a tip for the Derby. But to be fair to Sally she has been trying to prove that her shows rely on her ability to talk with the dead. Which is why I imagine her fan Sharon Baynard came out of the latest show and said: "The first two times I saw her she was brilliant but tonight she kept saying things that didn't seem to mean anything." Some things are just obvious.